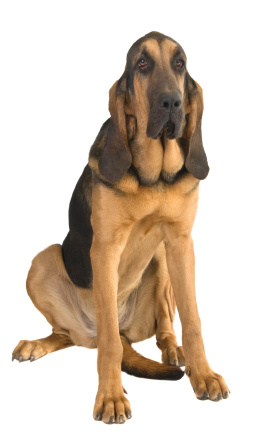 Learn about the temperament and personality of the Bloodhound. Discover what he's like to live with, his traits and characteristics and how he generally behaves. And look at lots of Bloodhound photos. Bloodhounds are the perfect companion pet for a human who wants a challenge. Their noble expression can be quite charming and a Bloodhound will be the most affectionate and loyal dog in the world, but you will earn it! They are stubborn. They like to be in charge and they assume that they are. While some breeds aim to please you, the Bloodhound aims to challenge you, just for his own entertainment. Possessing a superior sense of smell, a Bloodhound is likely to take off on a trail ignoring all your commands to stop. They need to be in a fenced-in yard (and they don't do well with invisible fences) or on a leash at all times. However, they can pull like a tractor, so start training them to walk on a leash early! A bloodhound puppy usually starts behaving like an adult at about three years old, but you will be training your bloodhound for his whole life. A "teenage" bloodhound will be very energetic and need lots of exercise. A "mature" bloodhound might nap all day. Bloodhounds of all ages will need to spend time with you and hate to be left alone. With lots of love and patience, the bloodhound can be well-trained and well-behaved, and several of them have done well in obedience competition. They are very intelligent, but it takes a while for them to learn not to chew and eat batteries, rocks, towels, and diapers. They are incredibly gentle with children, but need to be closely supervised, because children will be tempted to pull on the Bloodhound's extra skin. Their bark is frighteningly loud and deep. They also howl. So while they can be particularly stinky due to the folds in their skin, and while they can be a touch stubborn, while they can shoot drool and slobber on four walls at once, they are also loveable, loving, loyal, and fun, unless you want them to play fetch -- that they just will not do. They will shower you in cuddles and attention and needs lot of cuddles and attention in return. The Bloodhound is the hardest to train of all dog breeds. He learns new commands slower than all other breeds. You will need to be extra patient when Training him. The Bloodhound sheds a fair amount of hair. You'll find hair stuck to your couch, carpets, clothes and everything else in your home.